Mark Guynn of Berthoud, Colo., rides Gangsters Chick at the $15,000 RAM Invitational Reining competition at the National Western Stock Show. Gangers Chic is a 6-year-old mare owned by Whizzy Harper of Longmont, Colo.
Denver loves a horse show. That was true in 1907 when the fledgling “Western Livestock Show” had its first horse show and it is just as true 107 years later when the National Western Stock Show held the $15,000 RAM Invitational Freestyle Reining. Reining is one of the most popular horse events and one of the newest equestrian events to be added to Olympic competition. Reining incorporates a set pattern of speed variations, directional changes, spins, stops, and rollbacks. 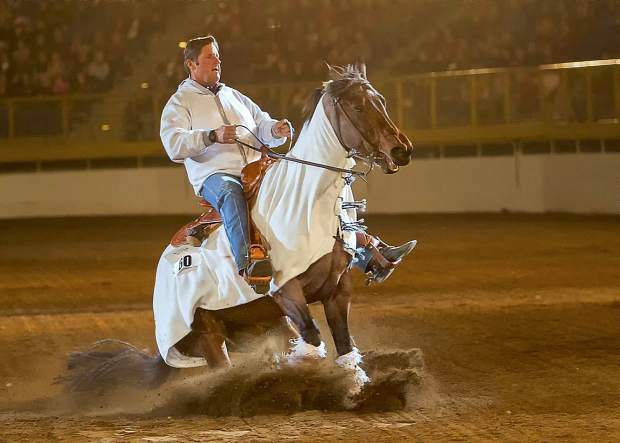 Freestyle Reining uses the same moves and patterns but allows the rider to present them in any order and incorporate props, costumes, music and special lighting effects to their presentations. The powerful stops and beautiful spins combined with the music, costumes and lighting have made the $15,000 RAM Invitational Freestyle Reining one of the hottest tickets at the National Western Stock Show. The knowledgeable and enthusiastic crowd roars their appreciation for the athletic moves of the horses and the creative presentations from riders and owners. It is a celebration of horsemanship and just plain fun to watch. Some of the presentations are lighthearted and fun, while others try to pay tribute to an event or cause that has a significant meaning to the rider. The husband and wife team of Randy and Jessica Dooley from Elbert, Colo., did both. Randy Dooley in his second RAM Invitational, did a whimsical presentation based on the movie character Shrek. Randy rode Spot who is better known as Monkey Dun It and owned by Brent Cohen. Randy and Jessica Dooley train reining horses on their SixK Ranch in Elbert, Colo.
Jessica Dooley rode Magnum Refund, a big, powerful Quarter Horse gelding owned by Gail Clappers. 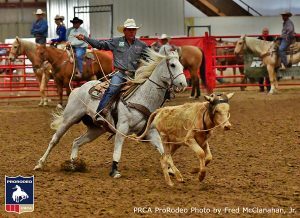 Magnum Refund had some powerful sliding stops and spins that earned Fifth Place in the $15,000 RAM Invitational Freestyle Reining.